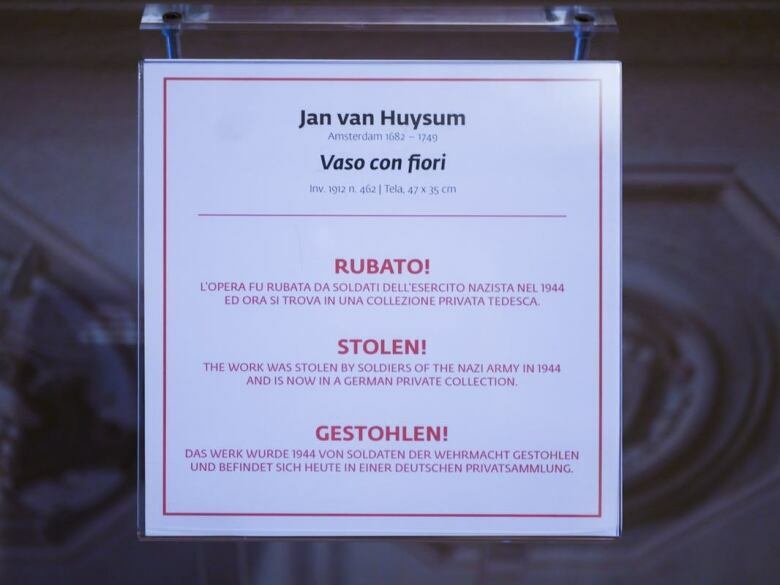 The Uffizi Gallery in Florence has prominently displayed an image of Jan van Huysum's Vase of Flowers with the words "Stolen" written on it in German, Italian and English. A museum director in Italy is trying to publicly shame a German family into returning a painting stolen by Nazi troops during the Second World War. 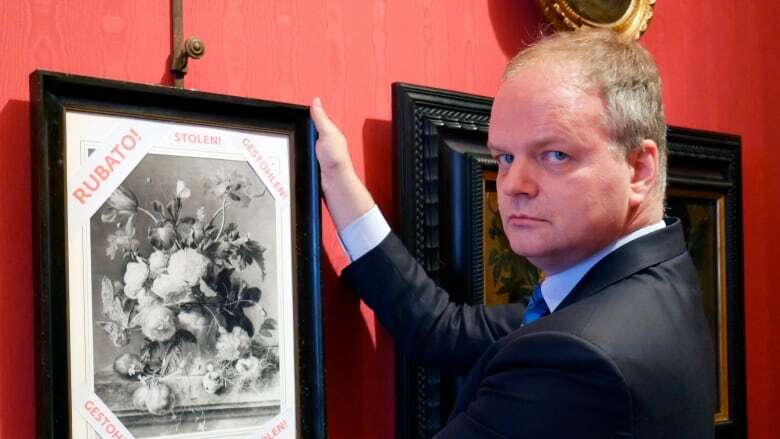 The Uffizi Gallery in Florence has prominently displayed a black and white photograph of the still-life Vase of Flowers by Dutch artist Jan van Huysum, with the words "Stolen" written on it in German, Italian and English. The art work is currently in the hands of an unnamed German family who hasn't returned it to the gallery despite numerous appeals. "There is no moral basis for a private person to keep a stolen painting at home where no one can see it," Uffizi director Eike Schmidt told As It Happens guest host Helen Mann. Instead, intermediaries for the family have demanded payment for its return to Italy — something the museum steadfastly refuses. "I never give up hope that someone really might step out of their role and just reflect and say: Well, do we really want to go into history as people who got money for a stolen painting? Or do we rather much want to go into history as people who return a painting to Florence, Italy, and become heroes?" The oil painting had been hanging as part of the Pitti Palace collection in Florence from 1824 until the outbreak of the war. It was given to the gallery by Grand Duke Leopold II of Tuscany, who bought it at the start of the 19th Century. During the war, it was moved to a nearby village for safety, but was stolen by retreating German troops. It didn't surface again until Germany's reunification in 1991, when offers to sell it back to Italy began. Not only does the museum have no interest in buying its own looted painting, but Schmidt says it would be illegal in Italy to exchange money for stolen art. If the family wants to sell it, they would have to do it within Germany, he said. But he's hoping his publicity stunt will prevent that from happening. "Thanks to the fact that this painting is now very much publicized, it will be very, very difficult to sell it," he said. Germany has refused to intervene in the case, citing a statute of limitations on crimes committed more than 30 years ago. Schmidt, who is German, said Nazi-looted art should be excluded from that statute. As It Happens has reached out to Germany's justice department for comment. If the family won't listen to the museum's appeals, Schmidt said he hopes the German government will. "The hope therefore is also that Germany would enact legislation that would make it impossible for people holding onto works that don't belong to them with the excuse of the statute of limitations," he said. Written by Sheena Goodyear with files from Associated Press. Interview with Eike Schmidt produced by Jeanne Armstrong.